Electrical consumption is not a consideration one usually puts at the top of the priority list when purchasing light box panels, but believe it or not, it's a very important factor. If you look at the power consumption of a traditional T5 light box and compare it to either CFL or LED light boxes, you will quickly see that there is "payoff" to be had over the years due to electrical savings. 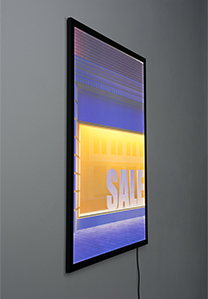 Some institutions may even have several light boxes installed throughout their facility or retail environment. Multiply these savings by multiple installed light boxes and the math becomes easy: CFL is best, closely followed by LED. This is a very important consideration that most purchasers don't even think about up front. Do you have a full-time, reliable janitorial or facilities management staff? Will you be shutting down each light box at the end of each business day, and turning them back on in the morning? Don't kid yourself, this virtually never happens! Flourescent are easy to remove but traditional T5/flourescent light boxes have bulbs that last about 1.5 years when run 24/7/365. When just one of two bulbs dies, a huge cold spot or shadow appears on your light box. Will a janitorial person quickly take notice, have extra T5 bulbs on hand, and come quick for a bulb change-out? Will the box sit idle for days on end, half lit up and half in shadows? The maintenance and bulb change-out is simple, but like mowing your lawn or cleaning your gutters, it can be an annoying and often procrastinated chore. So, if bulb changing is not your thing, don't choose T5 / flourescent technology. LEDs are more difficult to remove.Their bulbs are very difficult to change because they are very thin and installed into the light box frame in an integral manner. Unless you have a knack for tinkering, or some craftsmanship, these light boxes usually need to be returned to the factory for bulb replacement. A positive side is that LED bulbs will last 4 to 5 years when running 24/7/365. Believe it or not, for smaller light panels - less than 27" x 41" - many customers can justify the cost/benefit after about 5 years; they will just reorder a new light box when their old LED light box starts to deteriorate. This is one reason why we only offer CFL light boxes in smaller sizes (up to 27" x 41"). Larger sizes tend to become more permanent fixtures, installed into walls at airports and malls. Un-mounting the light box to change the bulb, or to return the entire light box back to the factory, can be a huge burden. This is why flourescent bulbs are more popular in larger light boxes. For smaller sized menu board and display stand applications, however, the LED lamp can be a good choice - especially when you can justify replacing the light box after 5 years. Also, the price of the light box 5 years from now will probably be a fraction of today's cost. LED light boxes have a life of about 100,000 hours! You will spend a bit more on the upfront purchase, but you will get payback in both convenience and cost-savings from bulb replacement (labor and materials). If you want brightness and to make the ultimate impression, than T5 light boxes are the best. They are, without a doubt, the strongest in brightness, often measuring in excess of 3500 LUX! You do, however, pay for this brightness in additional wattage and electrical consumption. But these T5's are bright! Both CFL and LED have similar LUX readings at applicable sizes. The CFL often measures a bit better than the LED, but to the naked eye, this would not be noticeable. A very tricky question to answer: "apparent budget" or "true budget"? "Apparent budget" refers to the initial purchase price, while "true budget" reflects the true cost after factoring in electrical consumption and the cost of bulb replacements. Flourescent light boxes are the cheapest; they have the lowest "apparent budget", but can easily cost more than the most expensive LED light box after 4 to 5 years of use. CFL light boxes are in the range of the T5 with "apparent budget", only costing slightly more than T5's. Electrical consumption savings, however, will soon pay for this difference. After just one year, the electrical savings with a CFL box will be more than the initial cost difference between the T5 and CCFL box. LED light boxes are by far the most expensive for "apparent budget", but this premium can quickly be justified by money saved from operating over a few years. Adding together the combination of electrical efficiency (very good), bulbs that last forever (approx. 11 years), and sleek profile, it often benefits to "pay-up" and invest more today on the initial purchase. All CFL bulbs (CCFL & T5), from tubes to compacts, contain a small amount of mercury vapor to create the light. Intact bulbs are not considered hazardous, but when thrown away, the bulbs get crushed and the mercury is released. Though it is a small amount, it is still deemed hazardous waste. Agencies such as the European Waste Catalogue (EWC), Environment Agency in the UK, and the Environmental Protection Agency (EPA) in the US have guidelines for disposing of these lamps. The EWC for example, requires that hazardous and non-hazardous waste be disposed of in separate landfills. Most agencies advocate that CFL lamps should be sent for recycling as a way of better managing the waste. 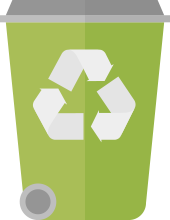 State and federal organizations list parties on their website that provide recycling services. The once acceptable practice of throwing lamps away is no longer acceptable and users of CFL lamps have "Duty of Care" to dispose of lamps properly. 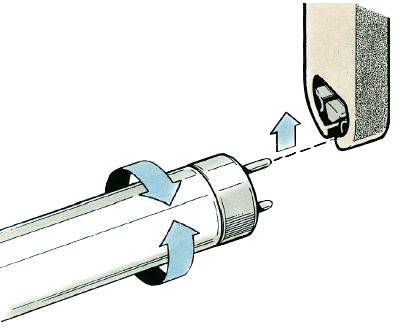 While rules and regulations for disposal vary, during the life of the bulb practicing energy conservation techniques is always encouraged. CFL bulbs offer great environmental advantages in that they convert electricity into illumination three to five times as efficiently as incandescent lights thus using less energy. Long Term Cost: It is true that LEDs are more expensive, but they can provide huge potential savings over the long term. While incandescent lights last for a paltry 800 to 1500 hours, and fluorescent lights last up to 10,000 hours, LEDs can last up to a staggering 60,000 hours. This can provide substantial savings as a result of fewer replacements. Maintenance: The amount of time spent replacing bulbs, especially in larger buildings, can be counterproductive. Due to the longer lifespan of an LED bulb over a fluorescent tube, maintenance and replacement times can markedly reduced when LEDs are used. Noise: Fluorescent tubes are notorious for being noisy, especially if they have been used for a significant amount of time. They tend to emit clicking and popping sounds intermittently, but most annoyingly, they can produce a low buzzing sound. 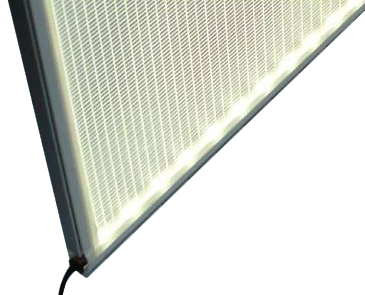 Since fluorescent tubes are often used in offices and working environments, this can be distracting. LEDs do not have this problem and operate silently with no annoying quirks or noises. Color: Fluorescent lights are notorious for their color profile. While some fluorescent tubes now use a different type of phosphorous powder to produce a warmer color, most fluorescents produce only a cold blue/white light. It is stark and not very welcoming. LEDs on the other hand provide all manner of different colors easily for any purpose. This is what makes LEDs so adaptable. They can be used in almost any environment or lighting situation. Environmental Impact: Fluorescent lights by their very nature must contain a small amount of mercury. This metal and vapour is extremely hazardous to both humans and the environment. If it is ingested or inhaled it can cause serious complications and must be disposed of safely. LEDs are completely safe and do not contain such poisonous materials, putting home owners and parents at ease while knowing that they are not contributing to pollution. Instant On: LEDs light up as soon as an electrical current is passed through them. Fluorescents do not do this and require time to flicker before staying on. Not only that but many fluorescent lights do not provide optimum illumination levels until they have been running for a few minutes. LEDs provide instant light and full illumination. Energy Consumption: LEDs consume far less power than fluorescent tubes. While fluorescents are technically energy saving light sources compared to incandescent bulbs, when contrasted with LEDs there really is no contest. LEDs use less electricity which is better for the environment and your wallet. Durable: Because LEDs are not made of glass and are hollow inside, they are far less fragile than both fluorescent and incandescent bulbs. This makes them much less likely to being rendered inoperable due to being dropped or bashed accidentally. It also lowers the risk of dealing with broken glass. Fluorescent tubes are a great lighting option for those wishing to pay less upfront. LEDs, however, provide long term savings, great performance, variable colors, and do not contain any hazardous materials. It is easy to see why so many businesses and home owners are turning to LEDs as their number one choice for lighting.